The Benevolent and Protective Order of Elks (B.P.O.E. 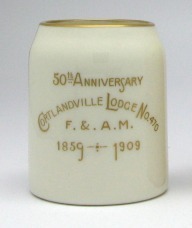 ), was founded in 1868 as an American fraternal order and social club. The club was originally called the "Jolly Corks" and were established as a private club to elude New York City laws governing the opening hours of public taverns. Today, the Elks or Elks Lodge is one of the largest American fraternal, charitable, and service orders with more than one million members throughout the United States. The 7th Avenue Hotel was built in 1890 in Beaver Falls, Pennsylvania. E.F. Hughes was proprietor during the early 1900s and also a member of the Elks. The hotel was torn down during the late 1980s. This china mug is a souvenir from Los Angeles, California and has a date of July 1909 in silver overlay. 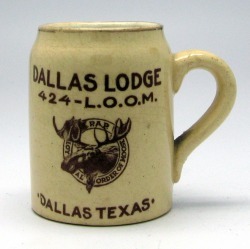 The next three souvenir mugs were given at the 19th Annual Reunion of the B.P.O. Elks, of Buffalo, New York, which was held on July 10-15, 1905. 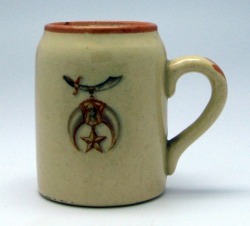 The mug above shows "Ye Old Hermitage." The bottom has an image of the "Rustic Arch". Freemasonry is a fraternal organization that arose from obscure origins in the late 16th to early 17th century. Today, the organization exists in various forms all over the world, with a membership estimated at around five million, including just under two million in the United States. Freemasons share moral and metaphysical ideals, which include, in most cases, a constitutional declaration of belief in a Supreme Being. F. & A. M. stands for Free and Accepted Masons. The fraternity is administratively organized into Grand Lodges or sometimes Orients, each of which governs its own jurisdiction, which consists of subordinate (or constituent) Lodge. In 1864, a meeting of Masons gathered in Prescott, Arizona at the home of Territorial Governor John H. Goodwin. A petition was signed by nine Master Masons requesting dispensation from the Grand Lodge of California to form the first Freemason Lodge in Arizona. The document was conveyed by horseback through Indian territory to Santa Fe, New Mexico, and then to California, where the dispensation was granted on April 22, 1865. Aztlan Lodge No. 1 in Prescott, was granted in January 1867, making it the first Lodge organized in Arizona. The Ancient Arabic Order of the Nobles of the Mystic Shrine, is commonly known as Shriners. Shriners was established in 1870 as an appendant body to the Freemasons based in the United States. Today, the organization is best-known for the Shriners Hospitals for Children. There are approximately 350,000 members from 191 temples (chapters) in the U.S., Canada, Mexico, Republic of Panama and Europe. The Loyal Order of Moose is a fraternal and service organization founded in 1888. Today, the L.O.O.M. has nearly one million members in all fifty states, four Canadian provinces, plus Great Britain, and Bermuda.